See the FCBN 51B - an enhanced version of FCN-51-B shown below. With the increasing scarcity of vintage Ampeg portaflex B-15N amplifiers, it seemed it would be a worthwhile undertaking to create a new version true to the spirit of the original series. This is truly a work in progress and a LABOR OF LOVE. 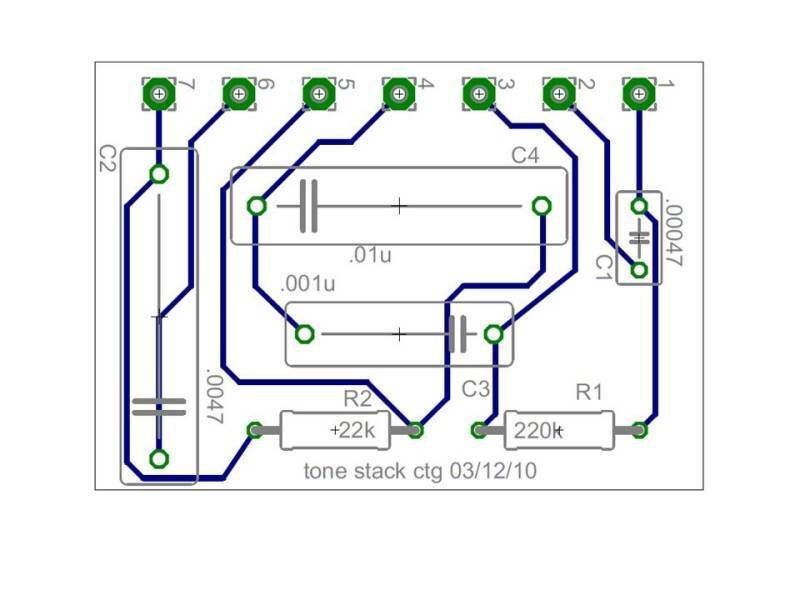 It is being designed to be straight forward enough to lend itself for assembly by an experienced amp kit builder. 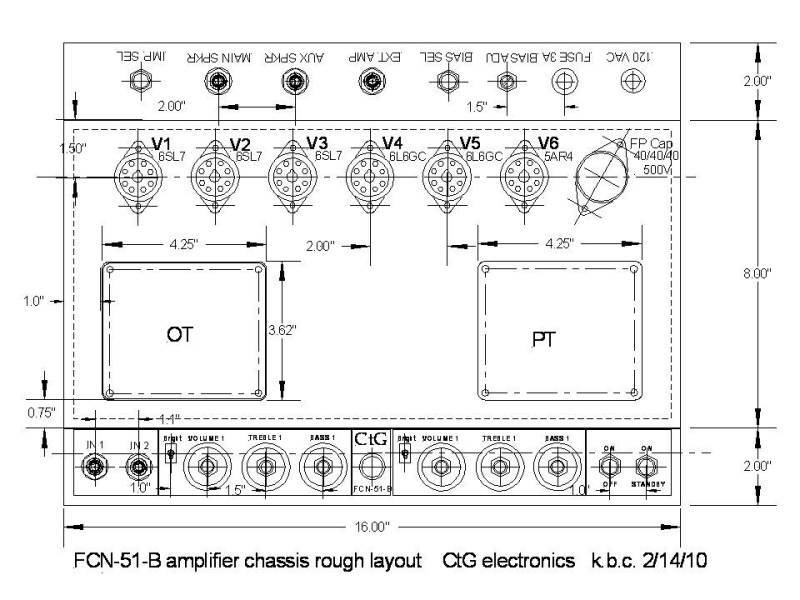 A brief description and design documentation for the CtG FCN-51-B is given below. The design of the CtG FCN-51-B was inspired by Mark Gandenberger's B-15-NC restoration project, which can be found at the Vintage Blue blog B-15NC project. Mark has shared his expert knowledge of the B-15N Portaflex double baffle cabinet to help make possible the recent release of the Ampeg Heritage B-15. An excerpt from Ampeg's Heritage B-15 webpage reads: "We worked hand-in-hand with many B-15 experts to create the Heritage B-15. The design is endorsed by the creator of the original B-15, Jess Oliver. The cabinet was created in consultation with Mark Gandenberger at Vintage Blue." 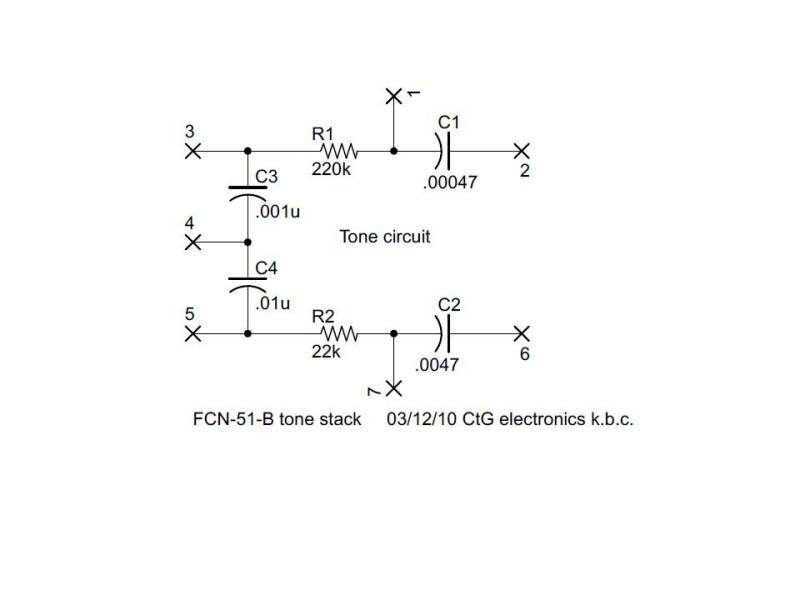 The FCN-51-B combines the original circuits of both the B-15NC (1964) as well as the later B-15NF (1965-67). 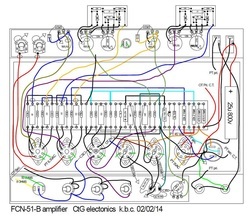 Maintaining these circuits keeps the same gain structure and biasing found in the original B-15N amp designs, helping to preserve their true heritage. Its two channels each have volume, bright switch, treble and bass controls. 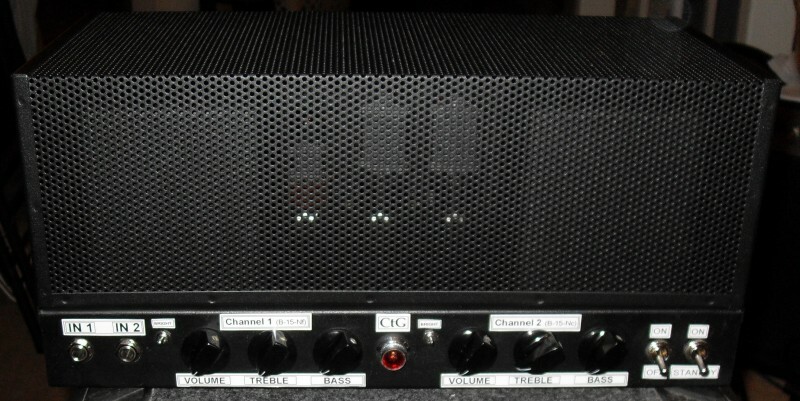 The first channel, from the B-15-Nf, has the volume control section before the tone stack. The second channel comes from the B-15-Nc which has the tone stack before the volume control. The power amp section has two switch selectable bias modes - fixed (B-15NF) and cathode (B-15NC). The FCN-51-B is designed to output approximately 25 watts (RMS) in cathode bias mode and 30 watts (RMS) in fixed bias mode. The power transformer can be a Fender Super Reverb type. The output transformer can be from the Ampeg SB-12 (like the B-15N, but un-potted), an OT-214 or a JTM 45 OT as originally planned by Ted Weber for his version. With removal of their bell covers they can be potted in metal cans. OT types with multiple impedance secondaries can use a back panel switch which allows selectable use of 8 or 16 ohm speaker loads. An 8" x 16" x 2" black p-coated steel Hammond p/n H1441-26 is used for the chassis. A black p-coat 8" x 16" x 5.2" perforated steel cage top p/n H1451-26 is also available from Hammond. Brass plates in front and back are used to facilitate grounding. Thanks to Philipp Setzepfand for finding errors in the power supply and phase inverter sections of the layout documents. 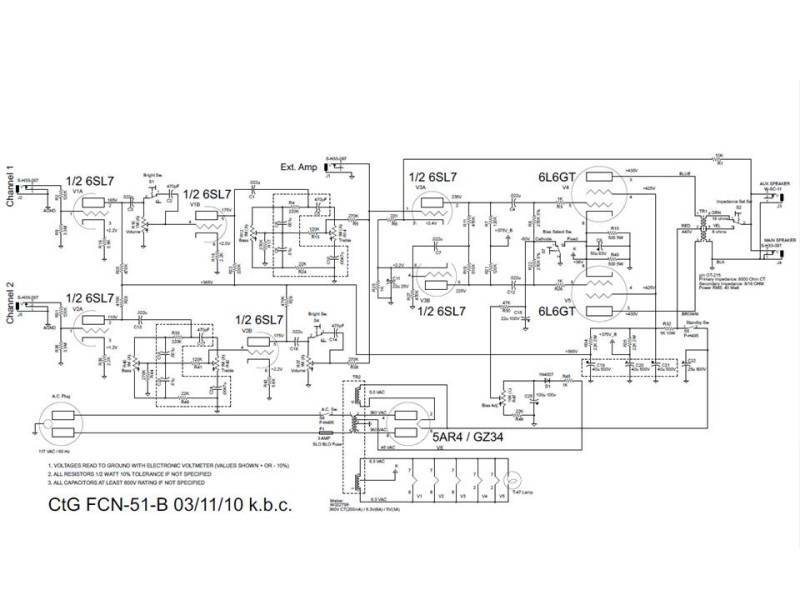 Copyright © 2009-2019 CtG electronics - All rights reserved.